Eduardo Pecchenino, great trombonist and conductor, born in Buenos Aires, in the neighborhood of Villa Urquiza, April 1, 1928. His father was an accordionist and his mother a member of choral groups. Both were Italian from Lombardy. Eddie began forming at 18 the Jazz's College, who played in the main cafeterias Buenos Aires and toured Chile. Then joined the orchestra of Julio Rivera, and Ricardo Romero, by a long tournee by Colombia and Central America. 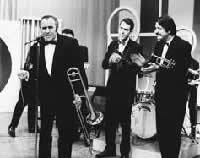 He went by the orchestras of Hector and his jazz, Tulio Gallo, Marito Cosentino, Eduardo Armani and Lalo Schiffrin. Then formed their own bands, which became a pioneer of rock & roll in Argentina. First used the pseudonym of Eddie Parker. 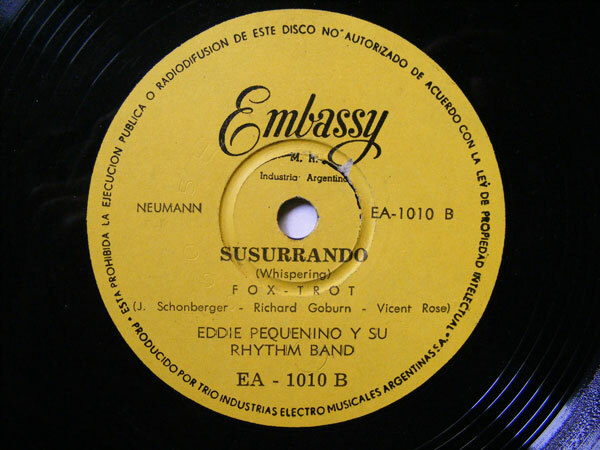 Recorded in Rosario for the Embassy label as Eddie Pequenino Y Su Rhythm Band, composed by Arthur Schneider (tenor sax), Hector Pizzicatti (trumpet), Abel Pizzicatti (piano), Alexander Schneider (bass), Manuel Chaqui (guitar and violin) , John D. Flores (drums) and J. Garbuglia (accordion), El Alegre Silbador", "Sonrisas", "En un Tren Rumbo al Sud", "Un Metro Cincuenta y Siete y Ojos Azules", "Susurrando", "Rata Paseandera", "Dinah", "Jingle Bells", "El Rock de los Santos", "Saltando el Rock", "St. Louis Blues", "Dos Corazones, Dos Besos". Then formed Mr. Roll and Rocks, with Arturo Schneider (tenor sax), Franco Corvini (trumpet), Buby Lavecchia (piano), L. Rea (guitar), Banjo (bass) and Jorge Padin (drums). With this name, or as Eddie Pequenino y Sus Rocks recorded for Columbia, and Orfeo, several versions of songs by Bill Haley: "See You Later, Alligator," "Mambo Rock", "I Cry More", "Rock", " Shake, Rattle and Roll "," Rancho Rock. " Involved in Venga a Bailar el Rock". In 1958 accompanied Bill Haley opening her shows at the Metropolitan Theater in Buenos Aires. In 1960 he made a tour in Europe with his band. On his return he turned to acting as a comic actor, until he suffered a cerebral thrombosis in 1978 left him bedridden and confined its activities. He died on July 21, 2000. Click the button below to add the EDDIE PEQUENINO Y SU RHYTHM BAND Embassy 1010 VERY RARE ARGENTINA Early Rock PROMO 78 RATA PASEANDERA / SUSURRANDO to your wish list.